You know the feeling. It's dark. You feel a prickle on the back of your neck... like your being watched. You spin around to see... Eeeeekkk! A pair of bright eyes watching you! Recreate that eerie feeling for your guests with this creepy Halloween theme party! 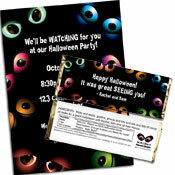 Halloween Eyeball Invitation - The perfect way to entice your guests to your Halloween Party. This design has matching favors, too. Custom Halloween Ticket Invitations - Personalize this realistic ticket invitation with your information and choose from several colors. Halloween Photo Ticket Invitation - Another great ticket invitation, but you can add your own photo. Sprinkle googly eyes in the envelope as a fun surprise! Add a bottle of Visine to the invite for an instant hit, “Eye” just know it! "Eye" hope to see you there. Extra invite add-ons are a great way to get guests ready to party! Send along wearables that guests can add to their costume - think vampire teeth, glow jewelry, and masks! You can use classic general Halloween decorations to fit an eyeball theme. Fog machines, orange twinkle lights and witches' cauldrons will help with an eerie atmosphere. But to tie in the main theme, make sure to have plenty of spooky, scary eyes! Hang a halloween eyes theme banner above the doorway. Add your own Halloween greeting! Wrap bushes in eyeball light strands front bushes to greet your guests as they arrive at the party. Cut eyeballs from construction paper and hang them in your windows. Add a blacklight to make them glow! Make yard monsters! Cut round eyeballs from foamcore and black pupils with a marker. Stick the eyes in trees and bushes to make "monsters". Jack-o-lanterns are a must on Halloween! Cut creepy eyes into each one and add different colored glowsticks for something a little different that fits the theme. Fill jars with sticky eyeballs and put them behind bars or on tables. Make an eyeball garland using ping pong ball and googly eyes. Perfect for the mantel! Add eyeballs to each balloon in a white balloon bouquet. Just draw a pupil and iris with permanent marker. Then put a bouquet in each corner and at all of your party hotspots. Really, any traditional Halloween decoration with eyes are perfect for this party... spiders, cats, ravens and bats! Black party goods is an easy choice for an eyeball theme party. Add in the eyeball theme by covering tablecloths with eyeball stickers or even those fun googly eyes you can get at any craft store. Vases of varied heights filled with rubber eyeballs look creepy and perfect. Add led lighting to make each vase glow! Arrange artificial black flowers in a vase, and add a ping-pong ball "eyeball" in the center of each flower. Make sure to secure with hot glue! This makes for one creepy centerpiece! Then scatter skeleton parts as confetti all around the table. And don't forget to put a halloween eyes water bottle at each place setting! An eyeball cake would be great at any eyeball theme party and is simple to make. Start with a round cake with white frosting. Pipe a red circle of frosting on the center and then using red frosting, pipe small squiggly lines coming out from the center. Even a cake novice can create a cake (or cupcakes) like this! Make sure to have a few eyeball Halloween games that guests can try. They'll love how these games match your theme! Eyeball Relay Race - Have your guests do a relay race, but instead of passing a batton, they pass a toy eyeball from spoon to spoon. They must run without dropping it or start again at the beginning of their lap in the race. Eyeball Pinata - This is really easy to make from a beach ball and paper mache. Pinata's are always the "hit" of any party! I Spy with My Little Eye - An easy game, often used by adults to occupy bored children on car journeys and the like. One person (the spyer) secretly chooses an object. They then say "I spy with my little eye something..." and then give a clue about the object, such as the color or shape. The players take turns to guess the name of the object. Somebody's Watching Me by Rockwell - "It Always Feels Like Somebody's Watching Meeeee..." That's because they are! Eye of the Tiger by Survivor - My favorite! We also have plenty of other Halloween Party Games to choose from. A bottle of Visine will get you some laughs! Candy is an obvious choice for a Halloween party! Make your favor special with a personalized eyeball theme chocolate bar. Halloween eyeballs mint tins are another great way to go. Personalize with your own message and add your favorite candy! Or have guests fill a halloween eyeball party favor bag at your candy buffet! Make sure to have bowls filled with foil-wrapped chocolate eyeballs, gummy eyes, eyeball suckers, and gumball eyes. There are so many candies out there that fit the eyeball theme! Everyone will have such a horrifyingly good time at your Halloween party they will be speculating about next year on the ride home!